Cuba’s communist government is demanding its removal from a U.S. list of state sponsors of terrorism despite its continued support for regimes that sponsor terrorism worldwide. Cuba was designated as a state sponsor of terrorism in 1982 and remained so in the State Department’s release this week of its most recent country reports on terrorism. The report noted that Cuba "has long provided safe haven" to members of the Basque Fatherland and Liberty (ETA) separatist group in Spain, as well as the Revolutionary Armed Forces of Colombia (FARC). Both are still considered terrorist groups by the United States and European Union but have participated in peace talks in recent years. Cuba also continues to "harbor fugitives wanted in the United States," the report added. 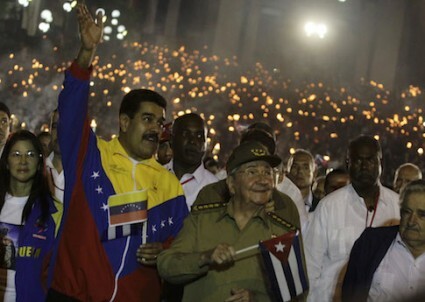 The report did not mention Cuba’s continued support for terrorism and violent repression directed by the governments of Venezuela, North Korea, Iran, and Russia. Still, Cuba’s Foreign Ministry said it should be taken off the list. "The Foreign Ministry energetically rejects the manipulation of a matter as sensitive as international terrorism by turning it into an instrument of policy against Cuba and it demands that our country be definitively excluded from this spurious, unilateral and arbitrary list," the government said in a statement. The State Department responded that it had "no current plans" to remove Cuba from the list. Cuba has most recently come under scrutiny for its role in advising the Venezuelan military. The communist island has reportedly sent hundreds of military advisers to Venezuela in exchange for about 100,000 barrels of oil a day. Critics say the current repression of protesters by Venezuela’s government is reminiscent of the "Cuban model." Trained and well-armed civilian groups known as "Bolivarian Circles" or "colectivos"—akin to the Castros’ "committees to defend the revolution"—are accused of killing several protesters in the last three months. About 40 people total have died in the demonstrations against Venezuelan President Nicolas Maduro. Additionally, a North Korean ship last year attempted to smuggle 25 containers of Cuban military hardware—including MiG-21 aircraft, air defense systems, and missiles—through the Panama Canal. Rep. Ileana Ros-Lehtinen (R., Fla.), who fled from Cuba with her family as a child, said in a statement to the Washington Free Beacon that Cuba "continues to pose a national security threat to the United States." "Just recently, the Castro regime has been responsible for training the ‘colectivos’ in Venezuela that violate human rights and murder innocent civilians and Cuba was caught trying to ship military equipment to North Korea in violation of many United Nations Security Council resolutions," she said. "The tyranny in Havana is also guilty of harboring terrorists, providing safe haven for American fugitives, and building a sophisticated spy network that seeks to undermine our national security interests at every turn." Cuba reportedly launched a broad campaign by its intelligence agents to pose as defectors at U.S. embassies around the world and keep tabs on U.S. intelligence agents, a program that intensified after the Sep. 11, 2001, terrorist attacks and continues. The Castro brothers also harbor more than 70 U.S. fugitives, including a former CIA operative who allegedly assisted former Libyan dictator Muammar Gaddafi with arms transfers and assassinations of his enemies abroad. Cuba’s close ties with Iran and Russia receive even less attention. Cuba’s foreign minister said earlier this year that the country supports Iran’s nuclear rights. Iran—one of the most prolific state sponsors of terrorism in the world—has trained, armed, and financed terrorist groups in Gaza, Lebanon, Syria, Iraq, Bahrain, Yemen, and Africa, according to the State Department report. The European Union criticized Cuba this week for its support of Russia in the ongoing Ukraine crisis. Pro-Russian separatists in eastern Ukraine, widely believed to be acting at the behest of Moscow, shot down two Ukrainian helicopters on Friday and violently clashed with pro-Kiev residents in the southern port of Odessa. Jose Cardenas, former National Security Council staffer in the George W. Bush administration and an expert on Latin America, said in an interview that Cuba is "in perfect company among state sponsors of terrorism." The country’s campaign to remove itself from the U.S. terrorism sponsor list is likely a public relations effort to lift sanctions, he said. "Their idea of peace and stability is a far cry from what most democracies and positive contributors to international security believe," he said. "It is in the DNA of the Cuban revolution to be a troublemaker in terms of international peace and stability." Cuban authorities continue to beat and detain dissidents and workers who challenge the government.